For many years, I have thought of September as a new beginning. Classes and workshops commence again with students returning to school and university, leaves on trees turn glorious colours before falling to the ground to nurture the earth for the Spring and new growth. "I had my beginning when an eagle flew overhead many years ago. The seed it dropped fell close to a tall cedar tree. I squirreled into the ground and lay quietly until spring. And I dreamed many dreams. It was a cold snowy winter. I didn't know that I was being protected by the cedar tree from the harshest of winds. "In that first spring I broke through the ground and looked around me. I wasn't very tall, but I saw I was different from my neighboring cedar. As spring moved into summer, my leaves grew; they were a different shape from the other trees around me. As the weather turned cooler they changed colours, and when the frost came, one by one they dropped to the ground. I watched, and I wondered. "Each year I had more branches, more leaves. Some of my leaves remained close by, while others danced - rising up with the wind, whirling into a spiral, before taking off again, headed for new destinations. "So the years went by. I matured, I grew. Intuitively I was connected to each leaf that had ever been a part of me. I 'felt' their ups and downs, their ecstasy as they soared, their helplessness when they fell. They were free spirits on their own mission. I had given them birth. "Many times I wondered what my purpose was. In my early years I was just a sapling at the base of my cedar. I often wished I was a tall giant in the forest. But now that I am mature I no longer wish to be other than myself. 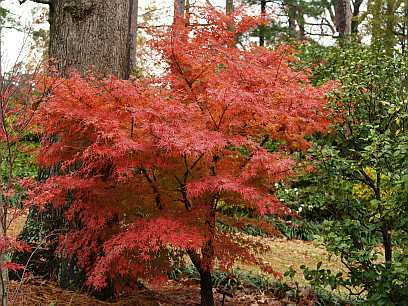 I have accepted that I am different; I like my red leaves that stand out and are noticed. And I do have a special purpose: my leaves that fall to the ground when the frost comes nurture not only my roots but those of my cedar, so we continue our journey of preparing for the following spring, for another 'new beginning'. "We are different, but we are one - just as I am not only one with every leaf that was ever a part of me, but I am one with all of Nature. I still dream many dreams. My journey is one of exploration - of growing, learning, accepting myself, and sending my leaves out into the universe. It is a journey that will never end. In my own way I soar like the eagle that gave me life." May you see and appreciate your uniqueness, your connection with all that is, may you soar like the eagle, and perhaps see this story as a metaphor for your life. And, may I suggest that each 'ending' is often brilliantly disguised as 'a new beginning'... and that is exciting! With a huge amount of support Innisfree's website now has a You Tube link to my 'Forever Young' talk given at a ministry convention in Sedona, Arizona.